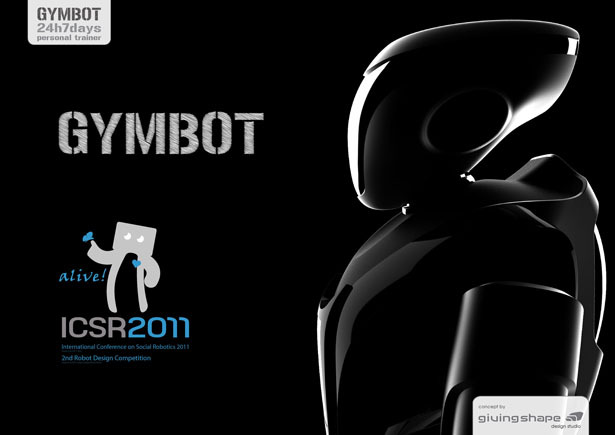 Presented at ICSR 2011 design award, Gymbot Personal Trainer Robot drew attention from many practitioners. Massimo Battaglia has come up with interesting scenario for the year of 2020 where obesity in developed countries would still be a big issue. Adults and young people do not maintain good balance between their body and food, they don’t actually care about their well being regardless they are aware of the problem. They don’t have the willpower to at least try to regain control of their lives, they prefer to use shortcuts which in the end are usually proven ineffective. 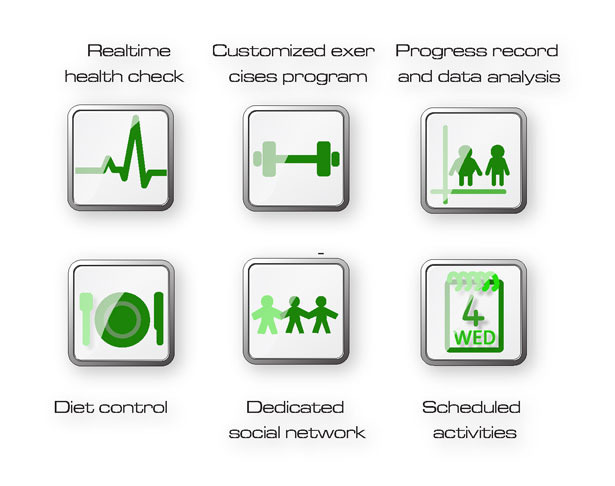 Overweight is not only a health problem, it can also be an issue when it comes to social and working relationship. There are solutions that promise you instant result, however nothing beats the strong will to have a healthy lifestyle. You will need a trainer that help you to control and correct your bad behaviors, give you the courage to keep your exercise routine to stay healthy and fit. 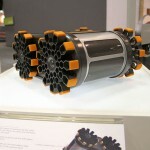 In the future, thank you to electric automotive industry, there will be great improvements in lithium batteries. 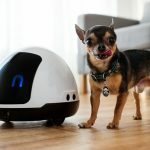 They will be a lot smaller, durable and economic, thus making the robotic technologies become more advanced and affordable. 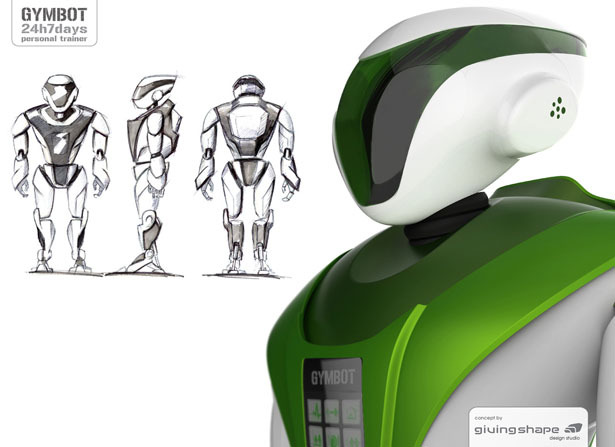 Gymbot Personal Trainer Robot stays with you, 24 hours a day to teach you how to take a good care of yourself, on both food and physical side. 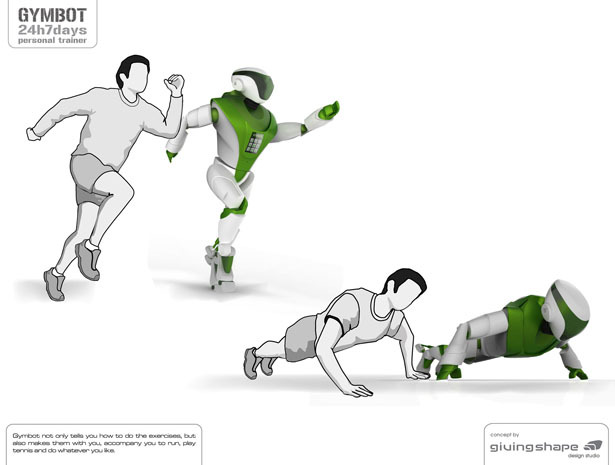 When you feel lazy, Gymbot Personal Trainer Robot will encourage you to do physical activity, just like a real personal trainer. This robot tracks your health record to tailor a physical activity program that suit you best, this robot will show you how to do the exercise properly. 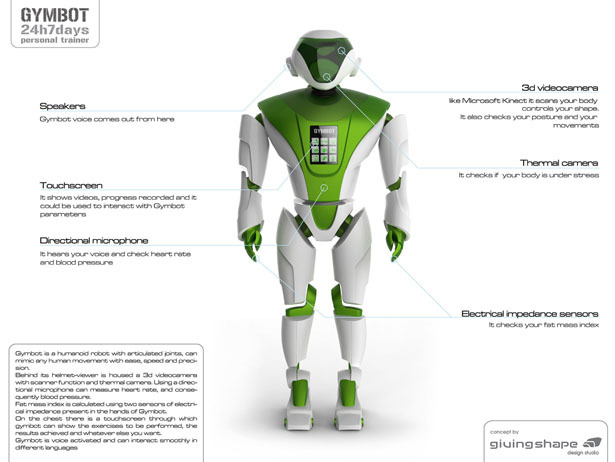 This robot is more than just your personal trainer, Gymbot evaluates your pulse and health in real time to prevent any undue stress. 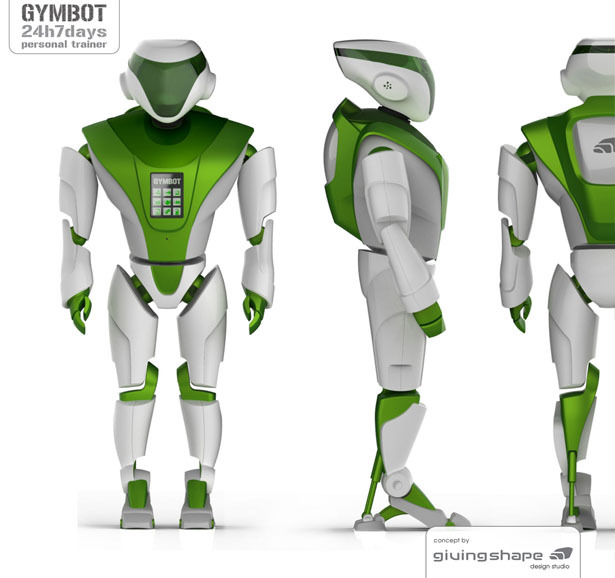 Gymbot Personal Trainer Robot has the ability to quantify your progress and is able to understand what and how much you should eat in order to give advice on proper diet. This robot is an innovative approach to prevent many health issues, it can help you to tackle your laziness, it corrects your bad habits. Gymbot is a humanoid robot with articulated joints that mimics any human movement with ease, speed and precision. Behind its helmet-viewer there’s a 3D video camera with scanner function and thermal camera. Using a directional microphone, this robot can measure heart rate, and consequently blood pressure. 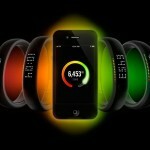 Fat mass index is calculated using two sensors of electrical impedance present on the hands of Gymbot. On the chest there is a touchscreen through which Gymbot can show the exercises to be performed, the results achieved and whatever else you want. 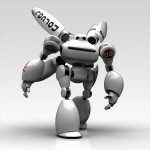 Gymbot Personal Trainer Robot is voice activated and can interact smoothly in different languages. 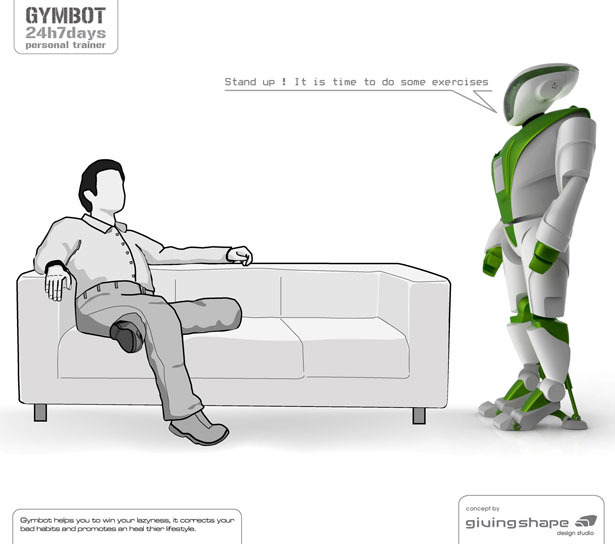 It has a dynamic design to evoke its function of personal trainer, the humanoid form was an obvious choice because Gymbot must be able to perform any movement when accompanies the user during exercises. 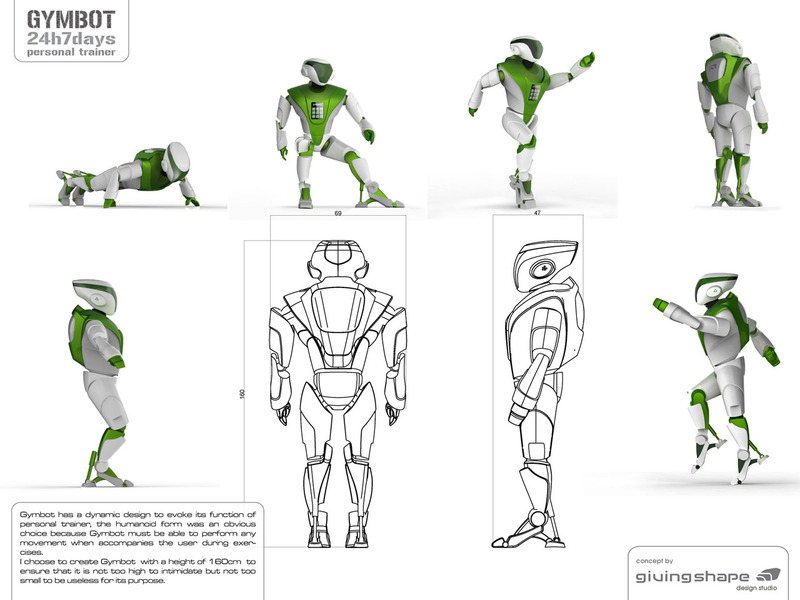 Tuvie has received “Gymbot Personal Trainer Robot” from our ‘Submit A Design‘ feature, where we welcome our readers to submit their design/concept for publication. 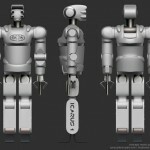 This entry was posted in Designs and Concepts, Robotic, Sports. Tagged as exercise, issue, lithium batteries, massimo battaglia, physical activity program, problem, robot, robotic technologies, Trainer, undue stress. 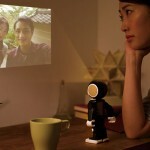 Needs to add TV projector display or acess to keep person Interested in excersices alone. Keep person Motivated during workouts alone can Help. this idea is peng just what my fat sister needs LOL!